Surface 2, Windows Blue, Windows Phone 8.5, Office 2013 and a new Xbox? 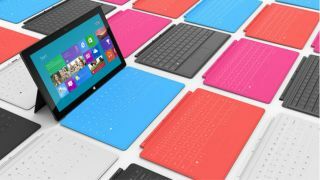 As well as Surface Pro, will we see more Surface RT models in 2013? It's been almost impossible to keep up with Microsoft in 2012.
, ramping up Surface production and a quick attack on Google for turning its shipping section into a set of paid ads rather than an actual search. Despite the on-again, off-again rumours throughout December, the Windows Phone 7.8 update won't come out until early 2013. Windows Phone 7 users get the new Start screen with three sizes of tiles, a version of the Kids Corner child lock, 20 new accent colours and dynamic lock screen wallpaper (with at least the Bing image of the day); Nokia phones also get a ringtone maker, Bluetooth sharing and lenses for the camera that let you remove unwanted objects and make partly animated GIFs. But what about Windows Phone 8 users? US users are already getting the minor Portico update that fixes some bugs, prioritises Wi-Fi and lets you easily send a text message to explain why you didn't pick up the phone. That comes to European users early in 2013, but the big update will be Apollo Plus; we're expecting that to be Windows Phone 8.5, to be announced at Mobile World Congress in February – but unless we're also getting Windows Phone 9 next year, we don't expect to see it until the autumn. We know Office 2013 (which is already finished and available for businesses, as well as on Surface RT) will go on sale in 2013, in January or February. Will we see Office for the iPad in 2013 as well? This is another persistent rumour that doesn't necessarily add up; Office isn't the only advantage of Windows RT but it's a key feature. If we do see Office for iPad it might only be the OneNote and Lync tools - after all, the Word, Excel and PowerPoint Web Apps were rewritten this year to run on iPad and Android tablets, which could be what Microsoft means when it keeps saying "Office will work across Windows Phone, iOS and Android". And whatever Microsoft has planned might be delayed or cancelled over arguments with Apple over whether they get a cut of Office 365 subscriptions for Exchange and Office licences for Windows and Mac sold through iOS apps. As expected, Microsoft will retire its Messenger IM service in favour of Skype in the spring (except in China, probably because of concerns that the government often discusses blocking the service). You can already merge your Microsoft and Skype accounts by logging into Skype with your Microsoft account (and you can still send messages to friends on Messenger and Facebook) but at some point that will become the only option. Given the Facebook and Messenger integration in Windows Phone 7.5 and 8, we expect that will coincide with the full release of Skype for Windows Phone (and possibly even an update to Windows Phone to make it all work together). The good news; there will be special offers to make the move more palatable - maybe free Skype minutes like those on offer with some Office 365 accounts. Another year, another set of rumours about the new Xbox. After seven years, we definitely expect Microsoft to launch a new Xbox late in 2013 and we really hope it includes the Forteleza Kinect Glasses project we've heard about, which seems to combine Google Glasses-style augmented reality with 3D screens. The $299 price that's been suggested probably isn't for what we're still calling the Xbox 720 for convenience (although it might be the Xbox8 and the internal codename is Durango) which might be based on ARM or x86 chips, possibly with PowerPC chips to run existing Xbox games.